This luxurious Hotel down touch quilt is the bedding essential for those who love to drift off in luxury. 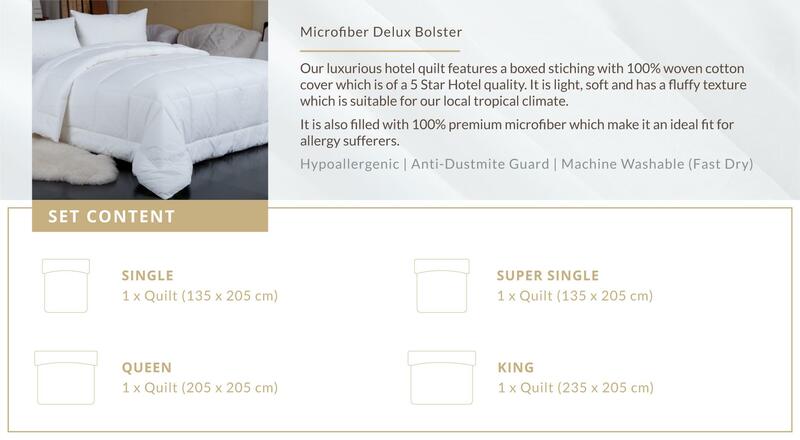 This luxury product featured boxed stitching for 5 stars hotel standards. This is a great replacement for a natural filling for allergy sufferers. The product arrived within two days, brand new and it does the work!! Very soft and fluffy, not too warm for the Singapore weather. The quilt is very soft and delivery is very fast. Within 2 days. Looks good and tried the quilt, it's really not bad for the price paid. The quilt is a bit thinner and lighter than expected or as I am used to, but it is good for SG I guess and easier to wash. Both the inner filling and outer cover material feel good and comfortable. Can't wait to try it! Very fast delivery ! Arrived on the next day of purchase. Very satisfied with the quality of the product.